Monitoring tool for checking Apache status page in Android mobile devices. Check your Apache status and see it nicely. 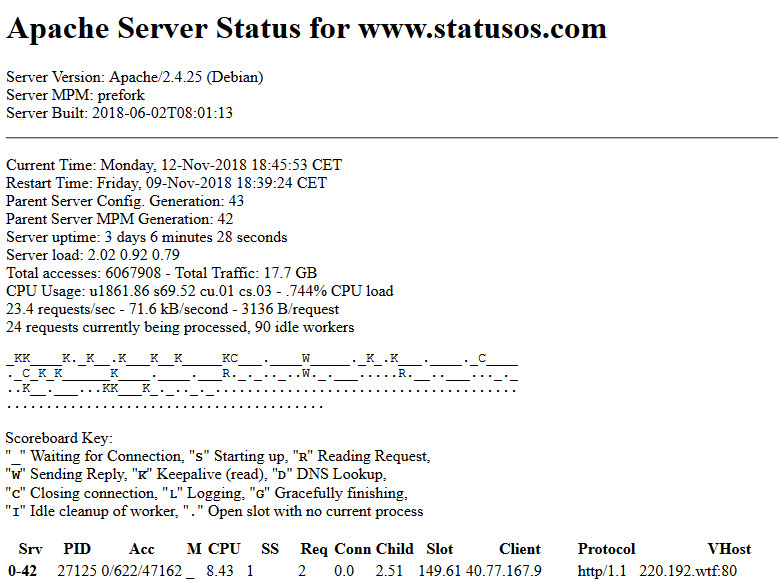 Check Apache status page nicely! Here are some screenshot preview images of Apache status monitor Android application. Let's see how application looks. Just try it and tell us what we should do better. The server-status component is enabled by default using the file /etc/apache2/mods-enabled/status.conf. You can download example .htaccess file to view Apache Server Status if it's enabled in your configuration above. Upload this file to status folder on your website. Try check status info feature on your server. Do you see info like picture below? You can successfully use our Android app. If you see some kind of error page, we are sorry, you have disabled status component on your webserver. You need to ask Administrator to activate this feature. Monitoring tool for checking Apache status page in mobile. Check your Apache status and see it nicely.